Yesterday a video posted on the site NSFW POA hinted that a naked blonde woman videotaped through a hotel peephole was a popular sports personality. ESPN lawyers pounced. Maybe we should mention the woman looks like Erin Andrews. I am the General Counsel of ESPN, Inc. It has come to my attention that you have posted on your site pictures of a young, blonde woman at [redacted]. 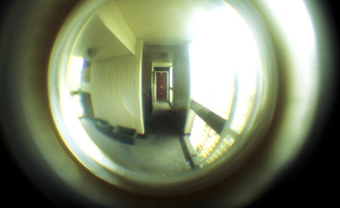 These pictures were obviously taken through a peephole or otherwise in a fashion constituting a trespass/assault on the rights of the woman involved. Your continued posting of these pictures are highly likely to render you an accessory after the fact to a criminal act. We hereby demand that you (i) immediately remove these pictures from your site and (ii) disclose to us the source of the pictures. We intend to hold you fully responsible for further display of material that so obviously violates the law. Please confirm by return e-mail that you intend to comply with these demands. In the absence of such confirmation we will assume you are an active and willing participant in these acts. Sheckler won't reveal the source of the original videos, but what makes ESPN's swift action especially notable is that, in his original post, there was no mention of ESPN or the name of the person being illegally and creepily watched. The verbiage on the post was actually "Hot naked blonde who looks a lot like a sports blogger favorite in her hotel room." But ESPN is obviously not taking any chances, even if the video turns out to be a well-constructed fake. We're still waiting for a statement from ESPN about the whole ordeal and any further legal action they plan to take.